Leinster skipper Leo Cullen has urged the province's British & Irish Lions contingent to add another glorious chapter in what has been an historic year for Irish rugby. Ireland have dominated the game in the northern hemisphere so far in 2009, winning their first Grand Slam for 61 years, while Muster also secured the Magners League title. Leinster yesterday made it a clean sweep of silverware for the Emerald Isle by edging Guinness Premiership champions Leicester 19-16 in a Murrayfield thriller to become European champions for the first time. The focus for Leinster heroes Brian O'Driscoll, Jamie Heaslip, Rob Kearney and Luke Fitzgerald will now turn to the Lions' tour to South Africa and their provincial captain backed the quartet to take their current form with them. "The international guys have had a bit of an amazing year," said Cullen. 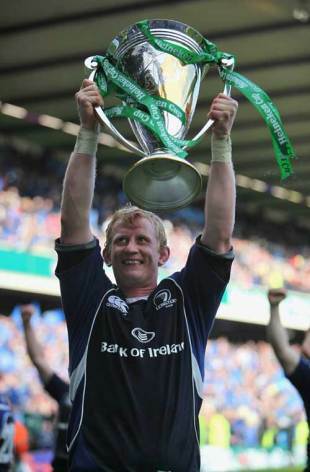 "It was a hell of a long wait for Irish rugby to win a Grand Slam. Similar to Leinster, there's been a group of players with the Irish team who have been around for a similar period of time. "They've had some disappointing days and had their fair share of criticism as well. I think it makes it all that bit sweeter when you actually do come away with the prize at the end of the day. Pushing on for the Lions, it's another great chance for three very young guys - Jamie, Rob and Luke - but they've had great seasons, all three of them. "Brian 'O': he's the talisman of our team and has been for so many years. I presume the Lions will look to him as well because he has such a presence about him on the field and in the dressing room. I suppose he's getting his just rewards for the amount of effort and for the standards he's set for other players over such a long period of time." The same could be said for Cullen who, like O'Driscoll, had endured a succession of near misses with Leinster since joining them as schoolboy. But the 31-year-old lock's biggest heartache arguably came at the end of a two-year hiatus at Leicester, when he was part of the treble-chasing side crushed by Wasps in the 2007 Heineken Cup final. Despite his joy at finally landing the club game's biggest prize, Cullen could not help but spare a thought for his vanquished former team-mates. "I had great times over there so it is mixed emotions," he said. "Obviously I'm delighted for Leinster because Leinster has been such a big part of my life since I was 17 when I first played for the schoolboy team. "Leicester is a great club and they'll be back again. They've had a really tough year; 36 games, it's a phenomenal effort, I think. To be fair, I think the Irish teams do have a slight advantage in the fact that they play a little bit fewer games than the French and English." And despite coming out on top at Murrayfield, Cullen insists it is two-time European champions and three-time runners-up Leicester who Leinster should look to in order to avoid yesterday's success being a one-off event. "We've got a lot of young players in our squad and we want to have that level of consistency where they're going to perform continually on an annual basis. Leicester are a team that have that and have had that for a number of years and that's something that we'll be striving for." Understandably Cullen's opposite number Geordan Murphy was devastated following the defeat and fears he may never get over it. "It's always going to be bitter," said Murphy, who equalled the record of most individual final appearances of four yesterday. "We lost in the final in 2007 and that still grates me, so I'm sure this will stay with me for a long time. "On the flip side of that, fantastic for those guys. I can appreciate what it means to them. But I wanted more than anything to win for Leicester." As well as the disappointment of defeat, Murphy was forced to endure the frustration of watching from the sidelines as Richard Cockerill's men surrendered a 16-9 lead. The 31-year-old's departure with a hip injury came moments before Jamie Heaslip scored the try that got Leinster back in the game. "It was actually my hip flexor that went at the end of the first half," said Murphy, who was part of Leicester's Heineken Cup-winning sides of 2001 and 2002. I said at half-time to 'Cockers' that I was struggling with it and when I got back out there for the second half, it wasn't really firing. "I think we played reasonably well and Leinster played that little bit better. The two drop-goals that they got were at key times and they kept the scoreboard ticking over nicely. In the second half, they worked hard to equalise at 16-all and they seemed to be pretty patient." Head coach Cockerill, who only took charge at Welford Road this year after Heyneke Meyer left his post for family reasons, insisted reaching the final was an achievement in itself for his side. "We didn't surrender anything. They're a good side, they put pressure on us and they took their chance. We put pressure on them and we scored; it could've gone either way. "I think it's a bit dramatic to say we surrendered a seven-point lead; we didn't surrender anything. We worked bloody hard and they had the breaks in the game. The boys have been manful the whole year. Our run's been the best of any domestic team in Europe after Christmas. "All I want to talk about is the positives for us because we should take a lot of credit for the way we've played this year."